HOME Location, Location, Location | How's the Weather Down There? | Last One in the Water... | The Mayan Yucatan | The Mayan Genius | How's the View Up There? | Halloween in Mexico | Bringing Something Back | Who? 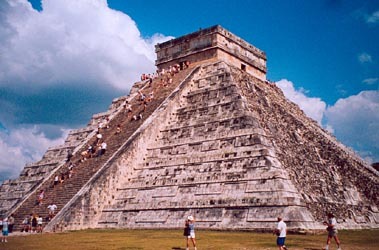 The Golden Age of Chichen Itza yielded incredible feats of wonder rivalled only by Stonehenge. 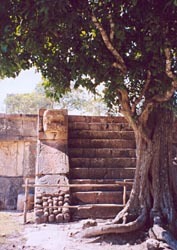 Within the largest compound of Chichen Itza, one finds architecture from the Golden Age of the Maya-Toltec culture. 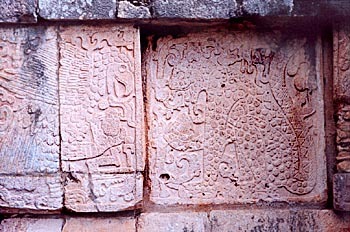 By roughly 800 AD, the Toltecs had arrived at Chichen Itza and become entwined with the existing culture. They brought with them their own religious iconography and architectural motifs. The Toltecs were a significantly more warlike people, who came with armies represented by eagles and jaguars. The architecture morphed to accomodate these symbols of earth, sky and might. 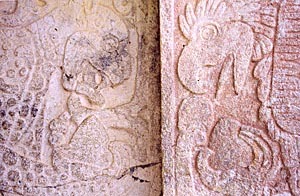 The carvings pictured above and below symbolize the Eagle Priest and the Jaguar Priest feasting on the hearts of victims of ritualized sacrifice. Generally, such victims were prisoners of war. 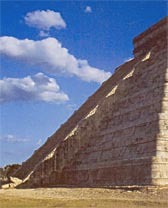 This 78 foot tall pyramid is the crowning glory of the Maya. It is, in fact, an astronomical calendar built of grey stone. Each side of the pyramid is made up of 91 steps. When you include the platform at the top as another single step, you have 365 steps. Each day of the year, the shadows fall on a different step, marking the passage of the sun. This solar pageantry culminates on the day of the Spring solstice, when the setting sun illuminates one step at a time in the shape of a diamond of light, leading down to the sculpted head of a serpent. The appearance is that of a snake slithering down the side of the mammoth building. Tourists come from all over the globe to witness the spectacle at the Spring Solstice. 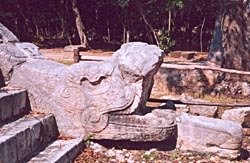 Below is an example of a serpent head similar to that of the one adorning the base of El Castillo. It is interesting to note that there is some controversy over the other source of sacrifice: The Captains of the elaborate game played out in the ball courts of the Maya. It was long held that the Captain of the losing team would be beheaded and have his heart removed, both being placed on the altar by the high priest. However, many archaeologists now believe it is the heroic Captain of the winning team that is sacrificed. They argue that this was seen as an honor by the Maya, as the sacrificee is responsible for ensuring the life of the larger community.